Gloria’s secret LinkedIn money-on-demand system revealed. She uses LinkedIn’s own search feature and finds profiles that need rewriting. Next, she connects with these people using LinkedIn’s internal messaging system. After her connection request is accepted, she sends them a short email telling them what she does. Finally, she uses her own, proven “no stress” closing technique to close the sale and collect another $400. But it’s not me I want to talk about. I want to introduce you to a remarkable friend and colleague of mine, Gloria Gunn! Gloria is a serial entrepreneur. She was one of my first customers back in the day when I started teaching others how to do offline marketing. She’s run her own offline agency and now owns a small software start up with another friend of mine, Mike Jones. The other day, I was skyping with Gloria, and she told me an amazing story. How Gloria Creates Money On Demand! Gloria started out selling SEO (search engine optimization). But, with all the Penguin and Panda updates a few years back, she saw her SEO business take a nose dive. Gloria had to make money though! At the time, she was getting most of her clients for her SEO business from LinkedIn. One day Gloria sat down in front of her computer and started reading the profiles of a lot of her LinkedIn connections. LinkedIn worked great for her, but it didn’t (and doesn’t) work that well for most people. She realized why. Virtually all of the profiles she saw were written very poorly. I’m not talking about grammar or spelling. I’m talking about from a selling point of view. They weren’t keyword optimized correctly so they would never get found with LinkedIn search. They were dry and boring. They read more like a resume. And, we all know how boring it is to read a resume, right? They had no call to action. And, they had a host of other problems. Gloria is a very smart and established online entrepreneur. One who, quite frankly, needed a lot of money fast! She decided right then and there to see if she could sell her own LinkedIn expertise with no cold calling, no direct mail, no cold email. She decided to see if she could use LinkedIn’s own internal search and messaging system to get clients for a profile writing service. Guess what? Boy oh boy did it ever work! Well, within only two weeks (all while working on this very part time), she was selling about three profile makeovers per week to new clients. Since she was charging $400 per profile, within only two weeks, she was making about $1,200 a week. That right there is $57,600 dollars per year! Within only two months, Gloria was selling close to one profile a day. $400 per day just for part time work! That’s over six-figures per year! I asked Gloria to show me exactly how she was doing this. And, thankfully, she’s a very good friend of mine, because she did. Let me share a few things with you before I show you Gloria’s exact system. First off, let’s talk about how big LinkedIn really is! According to Statista, there are over 400 million LinkedIn users worldwide. That’s close to half a billion! That’s 1/14th of the entire world population. Here’s a screen shot from Statista to back up that claim! Quick question! Do you think you’ll ever run out of clients for a LinkedIn profile makeover service? Furthermore, there is plenty for all of us! So, let’s get down into the nitty gritty of how this is done. Here’s exactly what Gloria does to make $400 per day, day in day out! She uses LinkedIn’s own search feature and finds profiles that need rewriting. Takes only 30 minutes a day to do this! Finally, she uses her own, proven “no stress” closing technique to close the sale and collect another $400! So simple in fact, that I bet you don’t believe it is this easy. Or that LinkedIn would even allow this. Let me dispel a few myths about LinkedIn. You can’t connect with people you don’t know! <==WRONG! You can’t message more than a few people per day! <== WRONG! Messaging people costs money! <== Again, WRONG! People won’t connect back with you! <== WRONG! People won’t respond to your message! <== You guessed it! WRONG! Finally, people don’t need a LinkedIn profile make over service! <== Oh God is this ever WRONG, WRONG, WRONG! Millions do!, and they’ll happily pay you $400 to do it for them! LinkedIn was built for professionals to use to expand their networks. As long as you stay within LinkedIn’s etiquette (don’t spam, don’t act stupid), you’ll be fine! Now you know how to do this! Now you know exactly how to make a real income with your own LinkedIn profile makeover service. I’ve told you exactly how to do this! If you want to know more, however, keep reading! 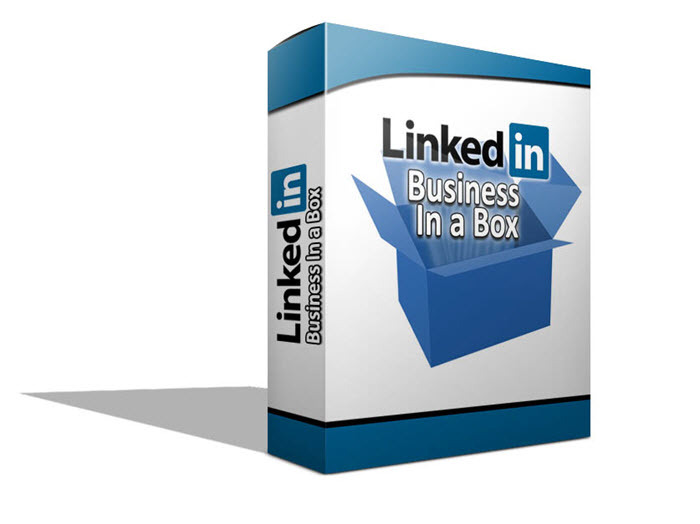 Introducing My New Training, LinkedIn Business-In-A-Box! I got so excited about how Gloria prints money on demand doing this, that I asked her to create a video course with me that would teach you exactly what she does. I’ve revealed what she does above. However, if you want to go deeper, if you want to really hit the ground running with this and finally create that income you’ve always been dreaming of, I’d encourage you to check out our new training! How Gloria built her LinkedIn connections into the thousands, and why she never, ever has to spend time reaching out to new people…they reach out to her! You’re going to get Gloria’s own message she sends out to prospective clients. This thing is split-tested to perfection! You’ll get Gloria’s own profile template. The template virtually writes a killer profile for you! Here’s the best part! You don’t even have to be a writer to do this! If you can copy and paste, you can create a killer profile for your new client, which you can sell for at least $400! How? When you get LinkedIn Business In A Box, we include Gloria’s proven template. It virtually writes the profile for you! This Is A No Cold Calling, No Emailing, No Direct Mail, No “Nuthin'” System! With Gloria’s LinkedIn Business In A Box system, you do not do any cold calling, emailing, direct mail, or anything like that. The clients come to you! Well, I can’t reveal exactly how this happens, but I can tell you that it all has to do with leveraging LinkedIn’s own internal structure and search capability. Only someone like Gloria who has a deep understanding of the psychology of LinkedIn users could have ever figured this out! Don’t worry though. You’re not going to have to spend thousands of dollars on high end LinkedIn training and countless hours actually on LinkedIn to make this system work for you. All you need to do is to buy this today and learn Gloria’s simple system. Then follow the steps and start making real money like she did! All You Have To Do Is To Take Action! Right now, you have a decision to make. I’ve already revealed to you what to do. You need to decide if you want in on Gloria’s new training! I know what I would do! I’d get this in a heart beat! Why? Because if you get this, and if you hit the ground running with it (actually do it), you could easily be making the kind of money Gloria was making in a similar amount of time. Of course, nothing will happen unless you take action! You know, this really is a complete “business in a box” system! Think about it! What would a complete system need? Well, you’d need a product <== We got that! You’d need an audience to sell that product to <== Got that, too! You’d need a method for selling the product that even a complete newbie can do <== Yep, got that too! You’d need an easy way to fulfill the sale <== And we got you covered there, too! Just as I said earlier! This is actually a complete business-in-a-box! All you have to do now is hit the buy button and pay through our secure payment processor, PayPal. The main training is a webinar that Gloria and I just did. This webinar has never, ever before been seen by anyone. In addition, you’re getting a complete transcription of that webinar. And, you’re getting Gloria’s own profile template and her own “client slayer” message that she sends out. Finally, you’ll watch another recording where Gloria’s partner, Mike Jones, implements Gloria’s system in real time and gets a prospect…in real time, right before your very eyes! It get’s better though! I’m going to shoulder all of the risk of your purchase, should you decide to buy our training today. Yep, that’s right! This is completely guaranteed! Lee This Sounds Great, But I’m Not A Writer Like You! Honestly, neither is Gloria! In addition to Gloria’s training, you’re going to get her own LinkedIn Profile Template. She’s got this thing down to a science. If you can fill in a few blanks with your client’s specific information, the profile virtually writes itself! LinkedIn Business-In-A-Box is our never before released training on how to start, build and run a LinkedIn profile makeover service. Gloria was making over $1000 per week within two weeks of starting her own service. She was making six-figures within only a couple of months! In LinkedIn Business-In-A-Box, Gloria reveals her own proven system. Anyone can do this. No experience required! Just a willingness to implement the system! I’ve run my own offline business for years now. I’ve created hundreds of training products, which have been purchased by tens of thousands of people. LinkedIn Business-In-A-Box is the simplest system I’ve ever seen to start making real money online! Get in on this today! We’re only offering this amazing training for a short period of time at this bargain price! PS: LinkedIn Business-In-A-Box is our never before released training on how to start, build and run a LinkedIn profile makeover service. Gloria was making over $1000 per week within two weeks of starting her own service. She was making six-figures within only a couple of months! In LinkedIn Business-In-A-Box, Gloria reveals her own proven system. Anyone can do this. No experience required! Just a willingness to implement the system! PPPS: OTOs? Yes, one! Amazing software called Linked Profile Writer. You DO NOT have to have it at all to make full time money doing this! Gloria didn’t have this software for close to a year! She had it developed long after she built her LinkedIn business. It helps, yes! But it is NOT mandatory!